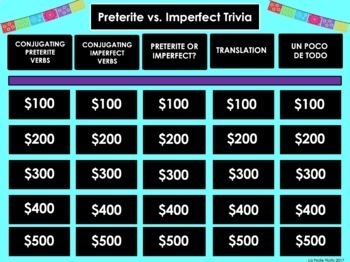 Looking for a super fun, NO PREP activity to review preterite vs. imperfect with your Spanish students? Play this Jeopardy-style trivia game with them! Students will be engaged as they work in teams to answer questions in the following categories: Conjugating Preterite Verbs, Conjugating Imperfect Verbs, Preterite vs. Imperfect, Translation, and Un Poco de Todo. In addition to the traditional point value questions that start at $100 and get increasingly more difficult as students work their way up to the $500 questions, there is also a fun ‘Make a Wager’ option for each category that is like Final Jeopardy. 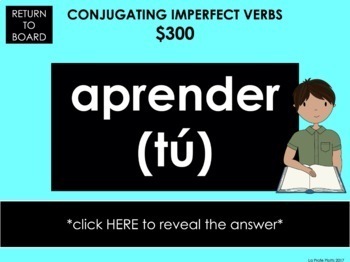 Both regular and irregular preterite and imperfect verbs are included in this game. This game is included in my money-saving Spanish Jeopardy-Style Trivia Games BUNDLE #2 which has 10 of these fun games at a savings of 25% off the list price! 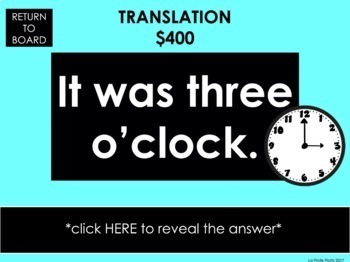 Click the link to see it!Need another preterite vs. imperfect activity? 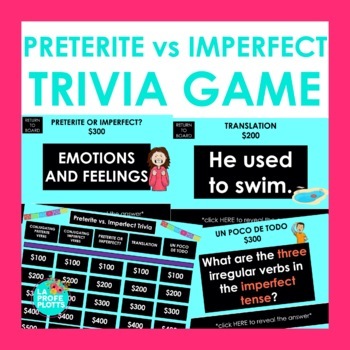 See all of the fun preterite vs. imperfect resources by clicking HERE. This resource pairs really well with my best-selling Preterite vs. Imperfect Task Cards and my ¡Cucharas! Spoons Game for Preterite vs. Imperfect. Click the links to see them! Looking for another Jeopardy-style game? Check these out! Did you know you can follow my store and receive notifications when new products are posted or upcoming sales? I have lots of engaging resources in the works and new products (except bundles) are 50% off for the first 24 hours! Click the green star by my store name to follow me!